February 12, 2010 - Commemorating the 75th anniversary of the loss of the U.S. Navy airship USS Macon, NOAA on Thursday announced that the wreck site on the seafloor within Monterey Bay National Marine Sanctuary has been added to the National Register of Historic Places. 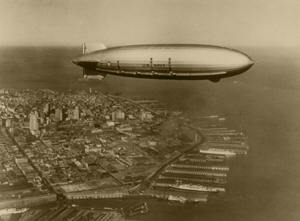 The Macon, a 785-foot dirigible was one of the largest airships in the world – comparable in size to the RMS Titanic. It was intended to serve as a scout ship for the Pacific Fleet and had the ability to launch and recover Sparrowhawk biplanes. Airship USS Macon in flight. “The National Register listing highlights the importance of protecting the wreck site and its artifacts for further understanding our past” said Paul Michel, Monterey Bay National Marine Sanctuary superintendent. The National Register of Historic Places is the nation’s official list of cultural places considered worth preserving. Authorized by the National Historic Preservation Act of 1966, the Register is part of a national program to coordinate and support public and private efforts to identify, evaluate and protect America's historic and archeological resources. Properties listed in the National Register can qualify for federal grants for historic preservation. The wreckage of the Macon and four aircraft lie at a depth of more than 1,500 feet and were first documented in 1990 by the Monterey Bay Aquarium Research Institute (MBARI). Monterey Bay National Marine Sanctuary conducted a sonar survey in 2005 followed by the first archaeological expedition in 2006 that documented the Macon’s remains. The expedition was a collaborative venture involving NOAA's Office of National Marine Sanctuaries, NOAA's Office of Ocean Exploration and Research, NOAA's Preserve America Initiative, MBARI, Stanford University, University of New Hampshire, U.S. Navy, Monterey Maritime and History Museum, and the Moffett Field Historical Society and Museum. The Macon wreck site includes the airship's hangar bay, containing its four Sparrowhawks and their detached landing gear. Five of the Macon's eight engines also have been identified along with objects from the ship's galley, including two sections of the aluminum stove and the enlisted men’s dining table and bench. Aluminum chairs and desks that may have been in a port side officer’s or meteorologist's office also have been found. “Dirigibles were an important development in the history of aviation and the Macon's remains represent the only archaeologically-documented example of such aircraft in the United States and possibly the world,” said Bruce Terrell, senior archaeologist, NOAA Office of National Marine Sanctuaries Maritime Heritage Program. The Macon wreck is the second site in Monterey Bay National Marine Sanctuary to be included on the National Register. The wreck of the California Gold Rush side-wheel steamship Tennessee was listed in 1981.